LSI has doubled the amount of flash on its MegaRAID card to 1.6TB and quadrupled the number of ports to 16 so the mighty little beast can be used to accelerate servers in hyperscale environments. The PCIe-connected Nytro MegaRAID cards combine a RAID controller with on-board flash and caching software to provide faster access to hot data. LSI says this card is meant for "scale-out server and storage environments with high disk counts and capacity requirements," mentioning cloud and hosting companies and similar hyperscale environments.. 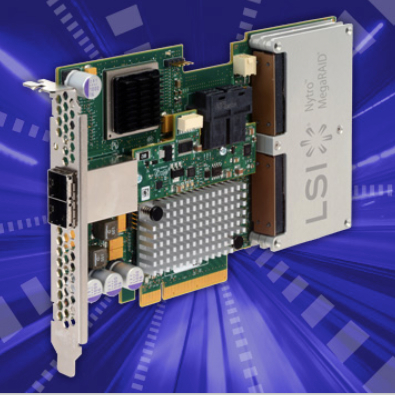 The MegaRAID 8140-8e8i PCIE flash accelerator card has four flash modules and 16 SAS/SATA connections: that's a quadrupling of the available ports. The card "integrates an expander into the architecture to provide scale-out server environments with connectivity for up to 236 SAS and SATA devices through 8 external and 8 internal ports." "For data protection by applying RAID to a defined capacity"
LSI claims the reporting enables users to measure the effectiveness of caching in their set-up. So far more than 100,000 Nytro PCIe flash cards cards have been shipped since the brand/product was introduced in April 2012. You can see the card at LSI's booth at World Hosting Days taking place this week at Europa-Park in Rust, Germany.